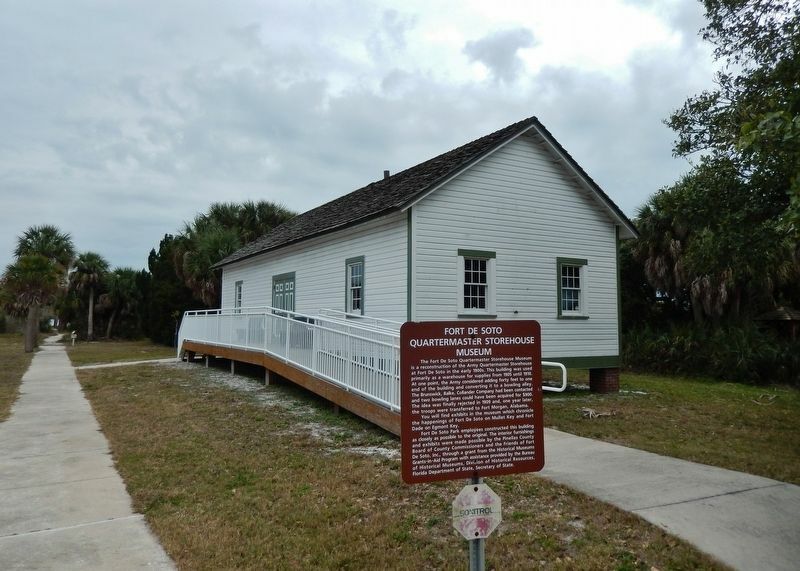 The Fort De Soto Quartermaster Storehouse Museum is a reconstruction of the Army Quartermaster Storehouse at Fort De Soto in the early 1900s. This building was used primarily as a warehouse for supplies from 1905 until 1910. At one point, the Army considered adding forty feet to one end of the building and converting it to a bowling alley. The Brunswick, Balke, Collander Company had been contacted and two bowling lanes could have been acquired for $900. The idea was finally rejected in 1909 and, one year later, the troops were transferred to Fort Morgan, Alabama. You will find exhibits in the museum which chronicle the happenings of Fort De Soto on Mullet Key and Fort Dade on Egmont Key. Fort De Soto Park employees constructed this building as closely as possible to the original. The interior furnishings and exhibits were made possible by the Pinellas County Board of County Commissioners and the Friends of Fort De Soto, Inc., through a grant from the Historical Museums Grants-in-Aid Program with assistance provided by the Bureau of Historical Museums, Division of Historical Resources, Florida Department of State, Secretary of State. Location. 27° 36.823′ N, 82° 44.098′ W. Marker is in Tierra Verde, Florida, in Pinellas County. Marker can be reached from Anderson Boulevard (State Highway 679) 1½ miles west of Pinellas Bayway South, on the left when traveling west. Touch for map. Marker is within Fort De Soto Park, located directly in front of the reconstructed Quartermaster Storehouse, near the southeast corner of the Gulf Fishing Pier parking lot. Marker is at or near this postal address: 3500 Pinellas Bayway South, Saint Petersburg FL 33715, United States of America. Touch for directions. Other nearby markers. At least 8 other markers are within 6 miles of this marker, measured as the crow flies. Spanish-American War Cannons from Egmont Key (about 600 feet away, measured in a direct line); 12-inch Seacoast Mortar: Model 1890-M1 (about 600 feet away); Spanish American War Memorial (about 700 feet away); Fort De Soto Batteries and Military Post (about 700 feet away); Tierra Verde Mound (approx. 3.9 miles away); Zephaniah Phillips' Homestead Site (approx. 5.1 miles away); "Pass-A-Grille" (approx. 5.2 miles away); Passage Key (approx. 5.4 miles away). Touch for a list and map of all markers in Tierra Verde. More. 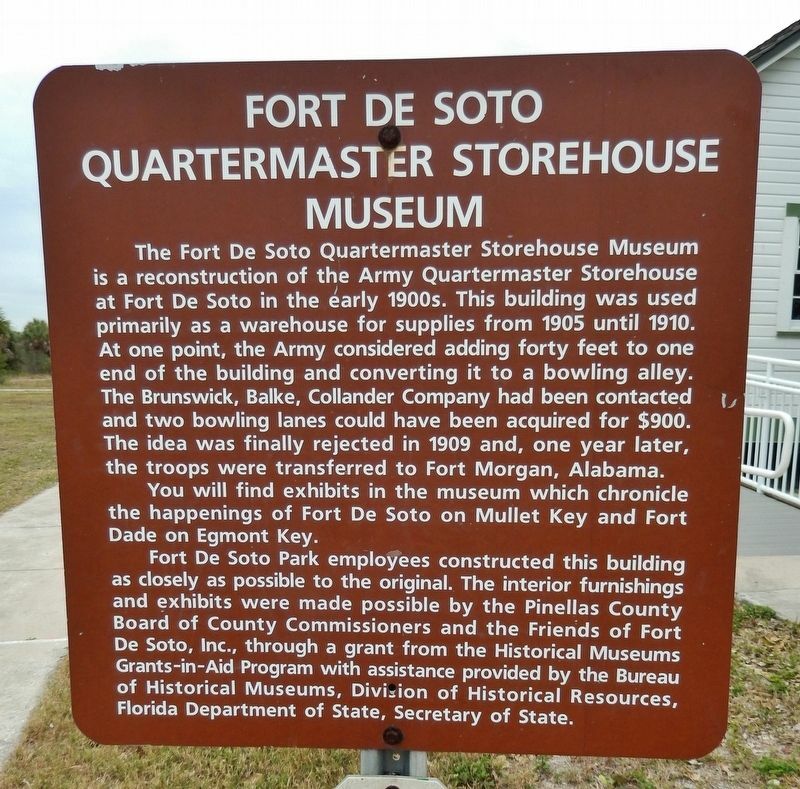 Search the internet for Fort De Soto Quartermaster Storehouse Museum. Credits. This page was last revised on April 9, 2019. This page originally submitted on April 8, 2019, by Cosmos Mariner of Cape Canaveral, Florida. This page has been viewed 35 times since then. Photos: 1, 2. submitted on April 8, 2019, by Cosmos Mariner of Cape Canaveral, Florida.